So many good picture books have been published about famous historical figures lately that we had to make a new section to feature them. 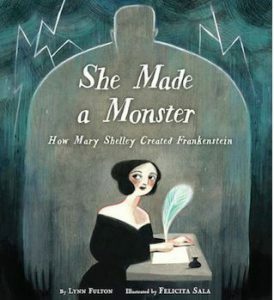 Please ask any staff member to point you to the “Genre_Lifestory” boxes where you will find books like this one about Mary Shelley who grew up to become one of the first major female writers. You will also find books about famous scientists, explorers, inventors and more. All of these books have great illustrations but will not overwhelm the reader with text. Other biographical books with more writing and fewer visual features will remain in the general biography section J 921. Happy reading! This entry was posted in Uncategorized by fellerk. Bookmark the permalink.